In 2015, the Thiruvananthapuram Municipal Corporation (TMC) came up with a waste management programme My city, Beautiful city. Part of the programme was a Green Army comprising students led by mentors working together to develop a green ideology and to build a better tomorrow. Today, Thiruvananthapuram is probably the first Indian city which has raised an army of students creating environmental consciousness not only in their schools but also in their homes, neighbourhood and residential societies. “When youngsters start working for the society, the elders too reflect on their actions,” said Megha, a class XI student of Carmel Girls Higher Secondary School and a member of the Green Army. Green Army follows the guru-shishya tradtion whereby school and college students are mobilised by individuals and non–profit organisations. 2,000 students from 30 schools (out of 200 schools in the city) are currently engaged with the Green Army. Each unit comprises of 50 students and is supervised by a mentor. The students, mentors and the municipal corporation meets regularly to set a course for future actions. “To start with, we provide orientation to school children on segregated waste management, green protocol and disposable plastics. They are also encouraged to take up green initiatives in their schools under the supervision of the mentors,” says Ashin Mohan, member Sahridhaya, a local non-profit and a mentor in the Green Army. 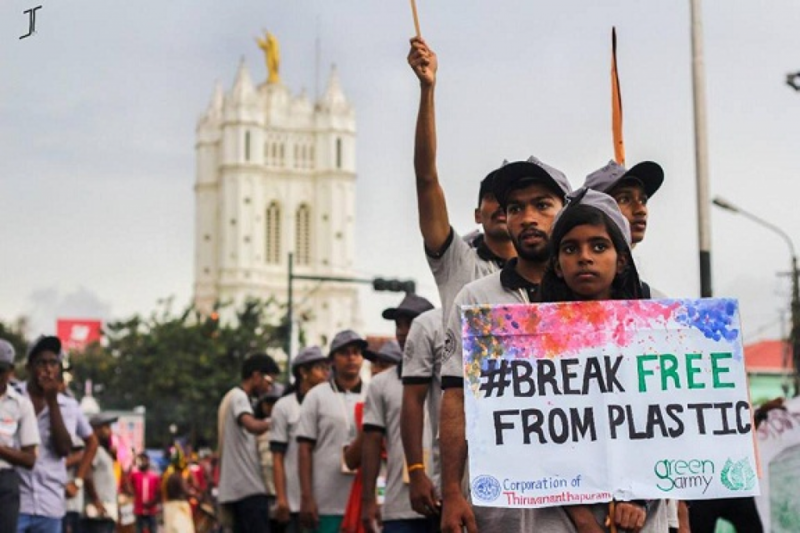 “The success of students in checking the plastics and disposables menace in the Attukal Bhagavathi Pongal festival became the foundation stone for Green Army,” adds Mohan. Every year (around February/March), lakhs of women come out onto the streets and cook pongala (a sweet porridge) as an offering to the Attukal Bhagavathy. Last year, 300 young volunteers deputed by the city corporation instigated people to avoid plastics and use their own steel glasses and plates. Apart from a drastic reduction in waste, the importance of the youth in the awareness programmes was also acknowledged. “Before 2016, the authority used to collect around 300-400 tonne of waste. But after the implementation of Green protocol (a set of measures established by the government to reduce waste) in Pongal 2016 the waste reduced substantially to 140 tonnes. With the inclusion of the young volunteers in Pongal 2017, only 80 tonne of waste was collected,” says Mohan. “It all started in April 2017 with a five day camp, Haritha Nagarolsavam, where around 200 students from 32 schools were given a hands-on-experience about the nature of segregation and waste management strategies. Their inquisitiveness is adding a new dimension to this initiative. Ideologies pertinent to sustainable living practices in an urban environment, water conservation and management, plantation etc are stemming from this,” says K K Krishna Kumar, a senior mentor. Alex Skariah George, a class XII student of PSNM Govt. Higher Secondary School says that after Onam celebrations last year, there weren’t any litter on the street. “The volunteers helped in checking the amount of plastic bottles and polythenes brought by the public and precluded people from discarding it at venues, raising awareness in the process. Bags made of cloth and other eco-friendly materials were also provided at venues. A vast majority of crowd supported the green Protocol,” George said. The students have started taking initiatives of their own as well, such as not buying thei favourite Sip up candy, using ink pens instead of ball pens and embracing clothes or paper bags. “After figuring out that the biggest issue in our school campus is the plastic sip up wrappers, I gave up using it and encouraged my friends to stop its use,” says Kishore S Kumar, a 9th standard student. The Green Army made its presence felt in almost every event held last year, be it the Kanakakunnu Onam (September 2017), India-New Zealand match (November 2017), the Vettucadu church festival (November 2017), Special Olympics (Jan 2018), or Vasantholsavam festival at Kanakakunnu Palace (Jan 2018). The Corporation plans to mobilise more students to expand the Green Army to other wards. Shibu Nair, Director-Zero Waste and Climate Action, Thanal, a non-profit actively involved in environmental awareness, says, “The plan is to expand the network beyond the city. Adopt neighbourhoods adjacent to schools for implementing zero waste, bring in serious academic projects on environment and conservation, and create more young environment leaders.” The plan includes covering 35 additional schools within the next three months. This is part of an initiative by the Centre of Science and Environment, called ‘Forum of Cities that Segregate’.